How Do Cows Stay Warm in Winter? 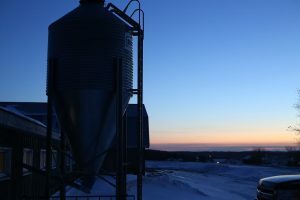 Ever wonder how cows here in Maine handle the sub-zero temps that we call “an average winter?” Sometimes people worry that while we’re all bundled up inside the cows are cold out in the barn – but it turns out they’re “Mainah’s” too and are built for cold weather. The truth is, cows are right at home in the cold temps. Their thick skin, coarse hair and natural insulation help them stay warm. They actually prefer cooler temps to warmer ones and are happiest between 40 and 65 degrees Farenheight. That said, they are able to stay warm in much cooler temps thanks to the warmth of their fellow barn-mates. Cozied up together cows actually generate so much body heat they can keep an unheated barn warm in freezing conditions. Sometimes the barn gets so warm, we’d like to snuggle in there with them! Farmer’s will usually give them a hand by hanging curtains or plastic over exposed areas of the barn to keep the wind out, and making sure they have access to soft, dry bedding, but other than that the cows act as their very own space heaters! While adult cows are excellent at staying warm on their own, sometimes calves need a little extra help, which is why most of our farmers have a separate calf barn where they house the little ones. These barns often utilize space heaters to help the calves keep warm, as well as extra straw for snuggling and oftentimes even “calf jackets,” which are like winter coats for the calves! They have a windbreaker outer layer and quilted interior for extra warmth. 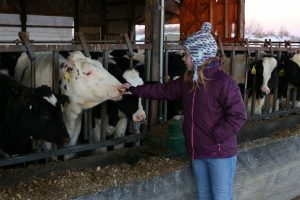 Do you have a question about cows or farming? We’d love to hear from you! Send a question via Facebook, Instagram or email and we’ll select a couple to answer in a future blog post. What happens to the calves? What do they eat? I have a friend who tells me that I shouldn’t drink milk because I am stealing their food. Those calves look pretty well taken care of and I don’t want to quit drinking milk.I like milk,a lot. Those calves are very well taken care of! Baby calves drink milk until about 3 months of age. At that time they are big enough to be switched over to grain and hay. You are definitely not stealing their food. Our farmers are very good about making sure all their animals are fed! How do they get warm then? Do Cows Sleep Standing Up?